I love corporate espionage and wish there were more good books in this sub-genre. The 50s had a bunch and I stumbled upon this one in the Maritimes (man, that trip is still producing!). I have to say that I am slightly pleased with my book choosing these last couple of years. When I stumble upon an old paperback which interests me but whose author I am not familiar with, I really fret over whether or not I should pick it up. So far in 2012, every single one of those books have turned out to be at least readable and often quite good. The Spiked Heel was another succesful find by me. After I read it, I did a bit of research and it turned out that Richard Marsten is the penname of Evan Hunter, who has the penname Ed McBain! Dude was prolific. 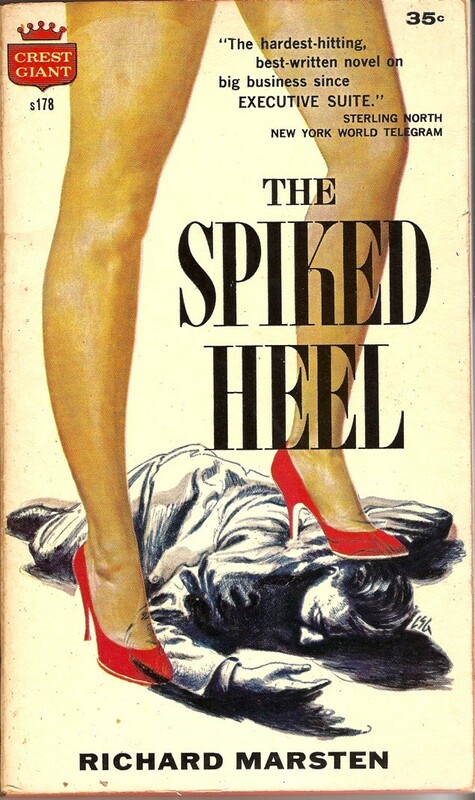 The Spiked Heel takes place in a high-fashion shoe company in the mid-50s, mainly in their manufacturing headquarters in New Jersey (their sales office is in the Chrylser building in Manhattan). A multi-generational family-owned company that was starting to get soft sells itself out to a much larger, mass-market shoe company from the south. McQuade, a hatchet man, big, blond, too handsome and too charming, is brought in. The protagonist, Griff, has worked at the company for 11 years and knows it from top to bottom. At first he doesn't realize that McQuade is there to shake things up, but as the book moves along he not only finally cottons on to that, he learns that McQuade is a force of evil. And that's what makes this book so crazy. Ostensibly, it is about this new guy coming in and forcing changes onto this established company. The book goes into great detail about the structure of the company, how the factory is run, how shoes are made. Some reviewers at the time found it a bit dull, but I found it fascinating. This was the peak of American manufacturing, with the skilled manual labourers of the old world working in the industrial context, producing 2,500 beautifully made shoes a day. And wow, they sure don't make shoes like this any more. All the cost-saving measurements that McQuade forces onto the company are only precursors to the way all shoes are produced today. You read about how shoes were made 50 years ago and you realize that even the fanciest bespoke shoes of today are actually pretty low quality. But the real energy here is the hyper-Freudian McQuade and how he forces himself and his irresistable quest for power onto everyone around him. It's kind of awesome. Not only can the sensible typist not resist lifting her skirt and shaking her rump for McQuade, but she is aware of it and tries to prevent herself from doing it, but his animal sexuality is overpowering for her. His first aggressive move is to break up a fight on the factory floor with a giant firehose, spraying his manhood all over the combatants until they cry. There is also an interesting regional sub-text that I suspect presages the more stark blue-state, red-state division we see today. McQuade is from the south as is the company he works for. He is such an extreme character that he almost doesn't seem human. He doesn't drink, he doesn't smoke, he doesn't laugh. When his impoverished background is revealed and the ferocious drive it inspired, he reminds one of Max Cady from Cape Fear. The only other southern character shows up at the end of the novel and though a force for reason, seems almost like an extraterrestrial. There is a real undercurrent that the South is the other and to be feared. The voices in the book are from the second-generation immigrants, the Italians, the Jews, the Irish that made New York such a vibrant place in the 20th century. There is a lot going on in this book and it doesn't all mesh well, like a smorgasbord of themes. The notion of "decency" is crucial to the protagonist's final understanding of how evil McQuade is. McQuade's technique is to do something brutal and then follow it up quite suddenly with disarming charm. He does this once by sticking his hand out for a shake after Griff stops him from taking the way-too-drunk typist home. When they grip, he then brutally crushes Griff's hand. He does it a second time at the end of the book and Griff agonizes whether he should shake his hand. He does again, to his regret again and realizes that it is common decency that compels us to respond when a man sticks out his hand for a shake. McQuade's not respecting that demonstrates his fundamental lack of humanity. I really enjoyed that idea. However, there is a side story about a woman whom McQuade takes out and rapes and while it is portrayed from her perspective with a thorough and interesting look into her background, it still comes off as very nasty and punishing for her. It's very in line with the sexual mores of the time (she was loose in her younger years, but was trying to change). But I'm reminded of the nasty mysogyny in the other Ed McBain book I read. In any case, thoroughly entertaining, with lots of rich material to analyze. Mad Men has nothing on this stuff. Wow, you have really cranked up the pace this month. Reminds me a bit of a book I read called No Pockets In A Shroud that was about the newspaper business. I got my reading groove back after the slight burnout at the end of 2011, so my pace has been steadily increasing. But the real blast recently has been due to insomnia and reading easy-to-digest paperbacks. My on-deck shelf was two layers deep and the front layer was all paperbacks. I am trying to work through them quickly to get back down to one layer and then work that layer down. The scene in the picture you posted actually takes place and is an important moment, the first time McQuade reveals his dark side.